Welcome to Turtle Beach! Your very own slice of paradise in beautiful Islamorada. 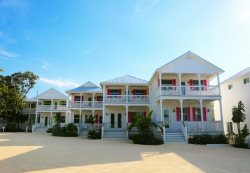 This newly built, state of the art, 5 bedroom beach home is located on one of the only white sandy beaches in the Florida Keys. The beautiful crystal clear waters of the Atlantic are steps away! The private home affords breath taking views from its huge windows and sliding doors that open to the wrap around deck. With four master suites with king beds facing open water, this home is magnificent indoors and out. Each bathroom is exquisite, featuring large stone, glass and hand picked tiles. Beautifully furnished, with spectacular views this is the perfect getaway for large families, reunions or groups. The home has been comfortably furnished to sleep up to 16. Snorkel right off the shore line! With a variety of water activities, including paddleboarding, kite surfing, kayaking,and fishing you may never leave Turtle Beach. Relax and float around in the new beach-front swimming pool!